Submitted by Alexander Briones on Mar. 12, 2018. Originally published on Mar 14, 2017 and most recently updated on Mar 12, 2018. We have sought to make this the most comprehensive and accurate guide to electronic drum sets for recording and playing live, updated for 2018. We set out to do this by conducting a detailed survey of the most popular and highly rated electronic kits at major online American music gear stores. This led us to short list over 30 kits for detailed analysis, for which we examined over 3,100 reviews, ratings, videos, and forum posts - including the most recent ones. The results are below for you to see with our algorithmically produced Gearank Scores out of 100 and reports on what drummers liked and didn't like about each kit. Here are market favorite entry-level electronic drum sets for students and budget-conscious drummers. The Roland TD-1K is a compact and streamlined electronic drum kit that makes their brand of quality and dynamic sensitivity more accessible to the masses. For the price, you are getting a drum kit with multi-zone and choke capable cymbals, along with velocity sensitive rubber pads, and quiet operation pedals. All of these are wired to its core, which is Roland's V-Drums technology equipped TD-1 module, with 15 kits to choose from and personalize. There's even a "Coach" feature that gives you scored exercises to help you improve your playing. Wrapping it all up is the TD-1K's compact stand that allows the kit to fit into small rooms, making it ideal for those who want to save on both money and space. Dimensions: 39.375" x 47.25" x 49.25"
Reviews for the Roland TD-1K are flooded with users who relish its premium feel and sound quality. Many of those who switched from cheaper kits appreciate the big jump in quality that it offers. A lot of drummers also find the size to be just right for their limited space. Other than a few bundle and shipping related issues, there are no noteworthy complaints about the Roland TD-1K's quality. If you're looking to get the best electronic drum kit with your $500, then the Roland TD-1K should be your top consideration if you're okay with the smaller size as demonstrated in the video below. If you want a good alternative that's a little easier on the wallet, then take a look at our analysis of the Alesis Nitro Mesh. The drum kits that topped this price category have compact profiles and student-friendly features, with all three spots secured by Roland. 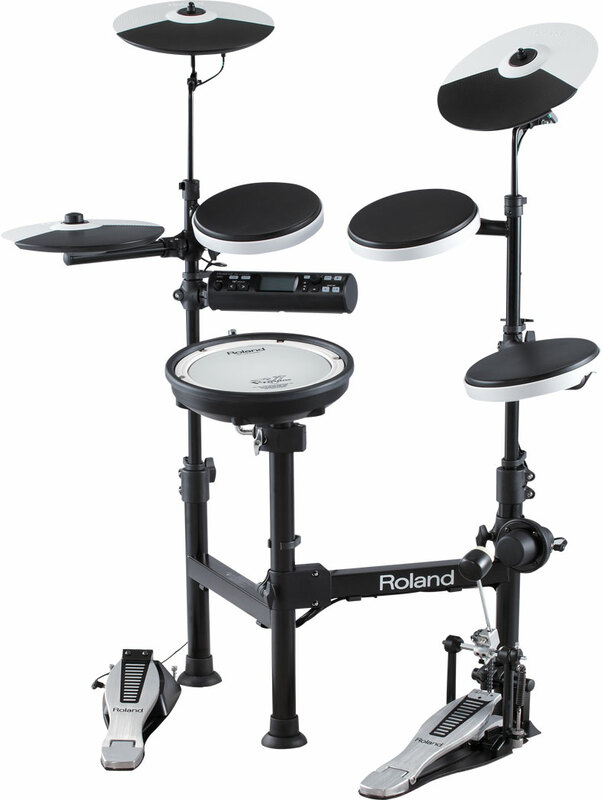 The TD-1KV is part of Roland's entry-level line which showcases their build quality in a more space saving form factor. It is a step-up version of the TD-1K, with the main difference being the PDX-8 dual trigger snare with mesh pad, something that's normally only available with more expensive kits. The snare is complemented by a complete set of toms, ride, crash cymbal and hi-hat, albeit smaller, to allow for full drum kit functionality without the bulk. While it doesn't feature Roland's SuperNATURAL sound engine, the drum module lets you choose between 15 drum kits, which should be enough for popular music genres. It also has essential student-friendly features like Coach mode, Metronome and Recording. 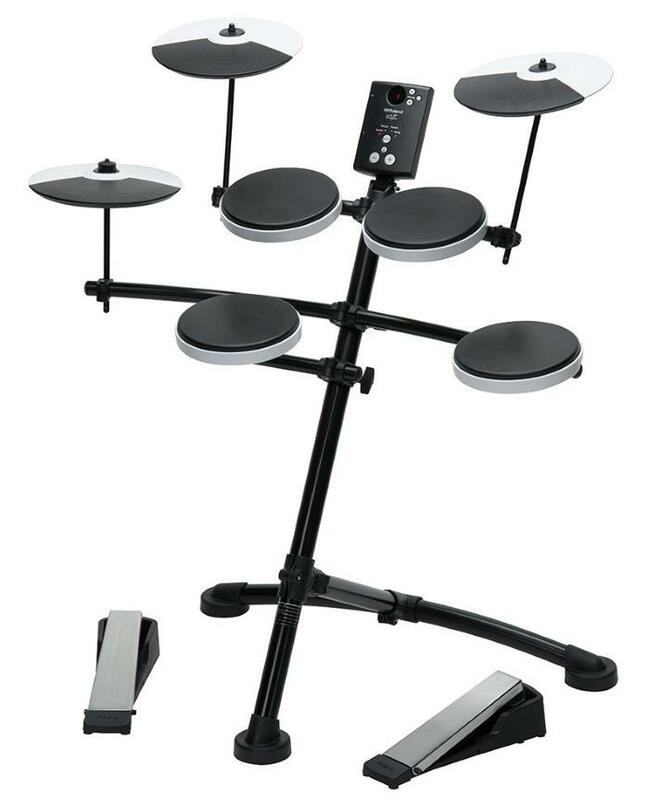 Finally, the entire kit rests on a compact stand that does not require much space, and weighs significantly lighter than other electronic drum sets. Market sentiment can be summed as the Roland TD-1KV being "just what the doctor ordered", providing just the right playing feel and sound quality at just the right price. While this kit is aimed at students, it continues to impress drummers with years of experience. It's compact size is prominently mentioned, along with its quiet operation. Both students and teachers report being satisfied with its performance. Some experienced users find the positioning of the stand to be limited, while others wished for more sound options. If you're looking for a budget-friendly and compact kit with upgraded snare, then get the Roland TD-1KV. With their years of experience building portable instruments and amplifiers, Roland knows how to balance quality, affordability and portability, as exemplified by this drum kit. The TD-4KP's distinct feature is its foldable drum stand, which hastens breakdown/setup, and lessens its overall footprint for convenient storage and transport. And it does all this without straying too far from the familiar drum kit setup, making it ideal for drummers who are always on the go, and for those who reside in small dorms and apartments. It comes with a complete complement of pads and cymbals, all of which feature Roland's brand of reliability and playability. The TD-4 drum module has 25 drum kits to choose from, and it allows you to customize the sound of each pad/cymbal with a variety of instrument sounds. Roland's student friendly features are available, including metronome, recording and Coach function. Dimensions: 39.38" x 47.25" x 49.25"
Many experts and experienced users describe the Roland TD-4KP as the best portable electronic drum kit. As a testament to that, the unit's foldable design, and build quality are among its most commended features. Many are impressed with the drum module's versatility, especially when considering its diminutive size. Sound quality also got a lot of thumbs up, even from drummers who weren't expecting much from the kit. The most common complaint is that you have to buy the kick pedal separately, even when it is already explicitly mentioned by Roland and their retail partners. Some users cautioned that it feels a bit fragile and suggest folding and moving the drum around with a bit more care. Finally, some users got more out of their TD-4KP when they swapped the rubber snare pad with a mesh head snare like the Roland PDX-8. The TD-4KP gives you a portable electronic drum kit with Roland's top notch quality, get it if convenient mobile drumming is your priority. Roland earns the top spot in this price range with their mid-priced electronic drum kit, the TD-11K. At the core of this kit is Roland's SuperNATURAL sound engine, which gives it the same realism and sound quality as more expensive units. And you're not getting just one good set of sounds, because the Drum Module lets you choose from a wide variety of drum kits and sounds. If that's not enough, you can also adjust the sound to your liking. Students will appreciate the built-in Coach Function, recording and other practice friendly features. For playability, the TD-11K features dual trigger pads, which include the mesh snare and rubber toms. The cymbals also have two triggers, and they can be choked. Finally, this kit is mounted on Roland's compact MDS-4V drum stand, which is ideal for small spaces. Dimensions: 47.25" x 43.31" x 49.25"
The quality differences between the Roland TD-11K and its competition are very evident to many reviewers, pointing to its playing feel and realism as its advantage. Sound quality along with the drum module's versatility get a lot of positive mentions. A good number of drummers are very happy with its adjustable design, which allows for a more personalized positioning of each pad. While retailers and Roland itself made it clear that this kit does not come with a kick pedal, some users still find this lack to be annoying. A few others are not too happy with the feel of the rubber toms, but still find the overall playability to be a positive experience. This market favorite compact electronic drum kit is your best pick in the sub $1000 price range, especially if you jump between different musical styles. This is the price range where drum kits cross over into the professional realm, with more stage/studio friendly features. 90 out of 100. Incorporating 225+ ratings and reviews. The Roland TD-11KV is an upgraded version of the TD-11K, replacing the rubber toms with premium mesh pads. One tom is the same as the 8" mesh snare, while the other two toms are slightly smaller at 6.5" but also feature mesh pads. This makes the playing feel more consistent as you hit the snare and the different toms. The cymbals are also bigger, having a 12" crash cymbal with two triggers and choke, and a 13" ride with three triggers. Other features of the drum kit are similar to the TD-11K, including the TD-11 Drum Module which houses the company's SuperNATURAL sound engine, 50 drum kits and multiple instrument samples. 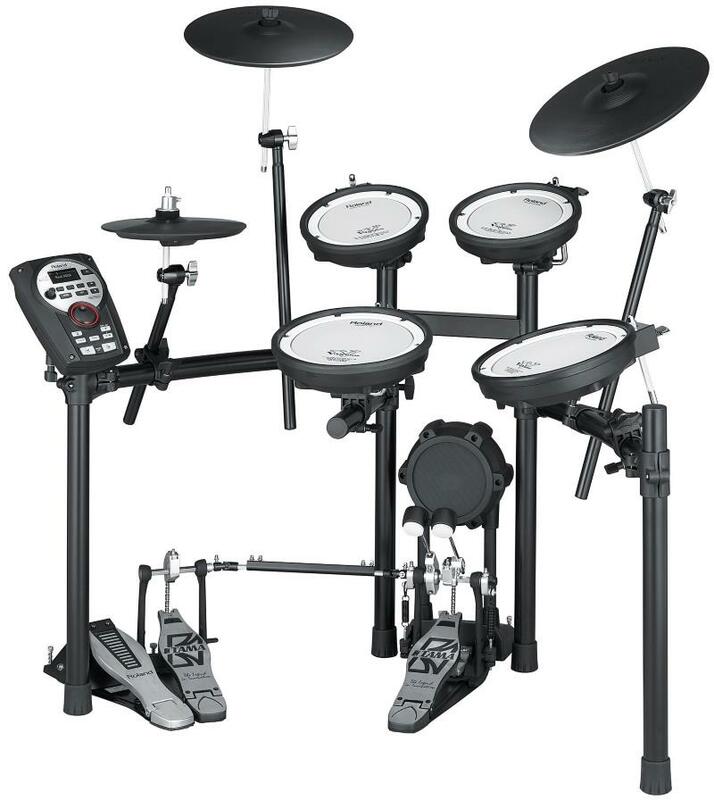 Student friendly features are also retained, making this a more realistic playing electronic drum kit that will help students of the instrument. The word "awesome" is a good one-word summary of how most users felt about the TD-11KV, most of which are impressed by its playability, thanks to the all-mesh pads. Experienced drummers appreciate the ability to tighten/loosen the mesh heads to get as close as possible to the bounce and feel that they prefer. The ability to tweak the kit's sound and sensitivity are also prominently mentioned, along with its overall build quality. While it does have a lot of kits already built-in, some users still wish for more sound options. The need to get a separate kick pedal riles up a few users. 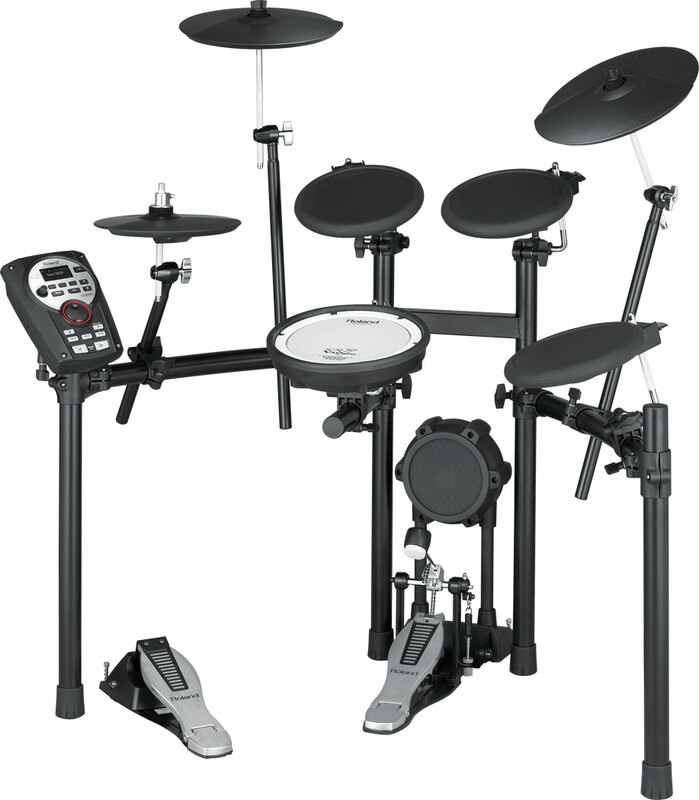 The Roland TD-11KV is ideal for drummers who want a reasonably priced all-mesh electronic drum kit. The DTX562K kits standout feature is the use of Yamaha's TCS (Textured Cellular Silicone) pads on the toms. This means that the snare and toms will have more accurate and uniform playing feel. The cymbal set is quite big at 13", with choke capability and an interesting feature called "pre-choke" which gives you muffled cymbal sounds much like when you're gripping a cymbal as you strike. Yamaha's DTX502 drum module allows for a wide variety of sounds with 50 drum kits and 128 instruments. It also allows for deep customization, including the ability to use your own samples. Other features include Groove tutorial, practice scoring and advanced metronome, all of which make the stage and recording ready DTX562K just as viable for learning. Dimensions: 77.3" x 41.3" x 26.8"
The Yamaha DTX562K gets most of its positive reviews from users who find its sound quality to be top notch. Some reviewers even claim that the Yamaha DTX502 Module has the best sounds in this price range, specifically the presets that are based on actual Yamaha acoustic drum kits. In addition, many reviewers credit the perfect rating scores they give to the kit's playability. There are some who report that the headphone and aux ports are awkwardly positioned. Limited upgradeability is also raised by a few others who plan to add more pads or cymbals in the future. 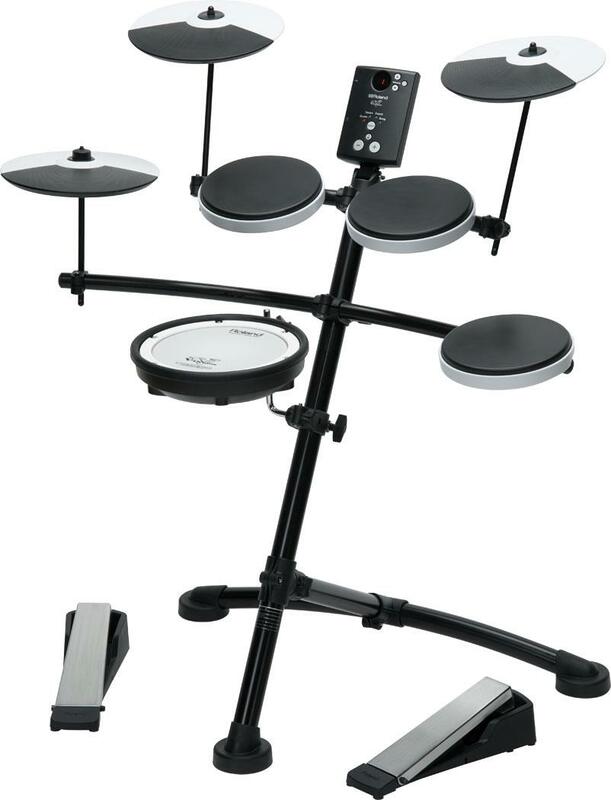 With Yamaha's reputation for quality and the DTX562K's improved features and good market reputation, this electronic drum kit is easy to recommend. Electronic drum pads are designed to be compact replacements for the acoustic snare, tom and floor tom. More affordable kits usually have rubber pads, while more expensive ones feature mesh pads. The general consensus is mesh pads are better, because they feel similar to acoustic drums. Since they are woven from strong polyester plastic (Mylar) they are also sturdier and quieter. Rubber pads are preferred for practical reasons, because they are usually lighter and affordable, ideal for compact and portable electronic drum kits. Note that pads are not limited to just mesh or rubber, as shown by Yamaha's silicon gel based pads. 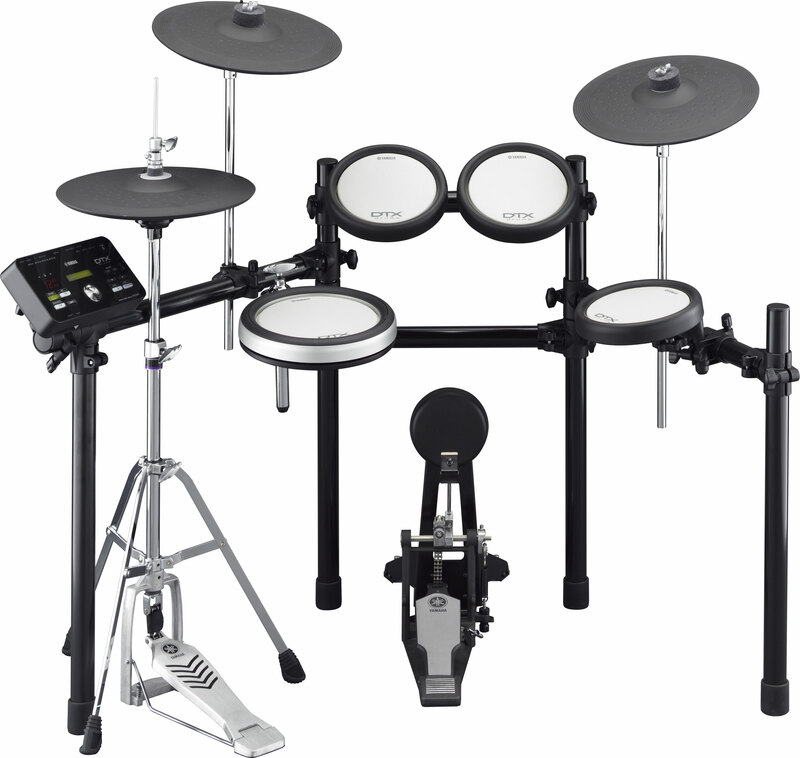 Electronic drum kits utilize plastic cymbals with specially designed rubber pads on top. They are designed to replicate the playing feel of metal cymbals and metal hi-hats - but are usually smaller, probably to save on cost and space. For the most realistic playing experience, you'll generally want a kit with at least a crash cymbal, a ride cymbal and a hi-hat. As for quality and feel, more expensive ones usually have more realistic bounce and feel, so you get what you pay for. Based on our market research, Roland cymbals are widely considered to be the gold standard, specifically the ones in their V-Pro series. Zones, also called Triggers, specify the number of sounds you can get from a pad, cymbal or hi-hat. Basic ones will just have one zone, which means that you get the same sound regardless of where you hit the pad. Advanced kits will have two or more zones. Dual zone pads usually have dedicated triggers for the head and the rim, allowing for rim shots and cross stick playing. Dual zone cymbals have dedicated triggers for the bow and edge. There are also triple zone cymbals that have triggers for the bow, edge and bell. Basically, you'll want kits that have as many triggers as your budget permits. Take note that, more expensive kits allow for "positional sensing" where-in the sound varies as you hit different areas of the pad. Cymbal choking is a technique used by drummers to mute cymbals with their hands. You'll want drum kits that have at least one crash cymbal with choke. Some technique adjustments are required to trigger cymbal choking, and it may vary from kit to kit. There are some that require pinching at the outer edge, while more advanced cymbals allow for easier choking. Some of these premium cymbals even allow for muffling and pre-choking. The Drum Sound Module serves as the central hub of the kit. It is where all the pads and cymbals are wired to, and it is where all sound processing and production takes place. It also houses the controls for which you can vary the sound of your kit. Sound quality is the primary concern, but it is inherently subjective, thankfully we only included top rated kits that the market deems to be good sounding in this list. Still, the data we gathered suggests that sound quality improves as price increases. Versatility is also important, you should watch out for the number of factory and user preset kits, available instrument sounds, and sound editing. If you're looking to improve your drum playing and musicality, training features should be an important consideration. Thankfully, many of the kits featured in this list have built-in student friendly features that include Advanced Metronome/Click Track functions, Recording and Playback, Songs/Tracks Play Along, and Training exercises. If you are planning to use your electronic drum kit to trigger virtual instruments in your computer, then USB/MIDI connectivity is imperative. Most modern drum kits utilize USB ports to send/receive MIDI data, so they may not dedicated 5-pin MIDI ports. Check the specs carefully if you need to connect the kit with MIDI devices that require 5-pin connection. The drum module is where the audio input and output ports are located. Essential audio connections are usually provided, which include a 1/4" output that goes to an amplifier or mixer, and a headphones out for quiet practice. Some modules have two 1/4" output ports for sending stereo signal, one being Left/Mono, and the other Right. Take note of the port sizes, especially with the headphones out, so you'll know if your headphones will fit, or if you'll need an adapter. Electronic drum kits don't have built-in amplifiers and speakers. You can use headphones when practicing on your own, otherwise they have to be plugged into a separate amplifier or PA system. Since electronic drums produce wide range of frequencies they are best paired with a dedicated drum amplifier or full range Powered PA Speakers. Keyboard Amps and Acoustic Amps also work well, and in case you have one available. One of the most often skimped and overlooked part of a drum kit is the drum throne. While you can use regular chairs, drum thrones offer more comfort, stability and movement freedom. So if you don't already have one, we recommend getting one along with the kit you will buy - see our guide to drum thrones. You should also shop around for a good kick pedal if the kit you're buying does not have one bundled. The same goes with advanced kits that require hi-hat stands, best get all required hardware ready so you can enjoy your new electronic drum kit as soon as it arrives. We first scouted for electronic drum sets that fall within the sub $2000 price range, and limited the search to those that are widely available in the US. For this update, we ended up with 34 kits, which became our basis to gather recent and relevant information, from customer feedback, YouTube reviews, Expert review articles and forum discussions. The data we gathered, which summed up to over 3100 sources, were fed to the Gearank algorithm resulting in the scores that we used to rank the kits appropriately. We then divided the list into different price ranges, and featured only those with the best scores. For more information about this process see How Gearank Works. Submitted by Jason Horton on Mar. 27, 2018. Submitted by Jason Horton on Sep. 11, 2018.